While adult tyrannosaurs wielded power and size to kill large prey, youngsters used agility to hunt smaller game. "It's one of the secrets of success for tyrannosaursthe different age groups weren't competing with each other for food because their diets shifted as they grew," said Ohio University paleontologist Lawrence Witmer. 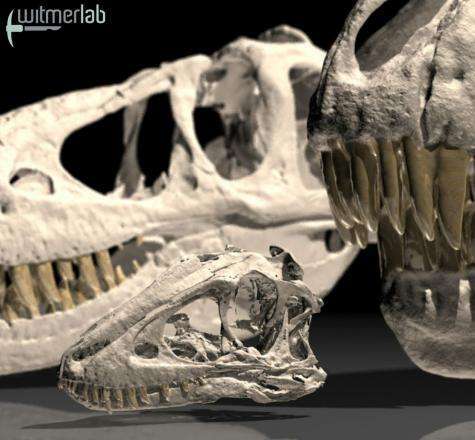 Witmer is part of an international team of scientists from Japan, Mongolia and the United States that analyzed the youngest and most-complete known skull for any species of tyrannosaur, offering a new view of the growth and feeding strategies of these fearsome predators. The 70-million-year-old skull comes from a very young individual of the Mongolian dinosaur species known as Tarbosaurus bataar, the closest known relative of T. rex. A newly discovered specimen of the Mongolian tyrannosaur Tarbosaurus comes from a juvenile only 2-3 years old when it died, providing insight into the growth and changing lifestyles of tyrannosaurs. Animation by Ridgely and Witmer, Courtesy of WitmerLab at Ohio University. The analysis of the 11.4-inch skull, published in the Journal of Vertebrate Paleontology, revealed changes in skull structure that suggest that young tyrannosaurs had a different lifestyle than adults. large muscle attachments, bony buttresses, specialized teeth. The juvenile is so young that it doesn't really have any of these features yet, and so it must have been feeding quite differently from its parents." The skull was found as part of an almost complete skeleton, missing only the neck and a portion of the tail. Based on careful analysis of the microstructure of the legs bones, co-author Andrew Lee of Ohio University (now at Midwestern University) estimated that the juvenile was only 2 to 3 years old when it died. It was about 9 feet in total length, about 3 feet high at the hip and weighed about 70 pounds. In comparison, Tarbosaurus adults were 35 to 40 feet long, 15 feet high, weighed about 6 tons and probably had a life expectancy of about 25 years, based on comparison with T. rex. although it does give new meaning to the phrase 'terrible twos,'" said Witmer, Chang Professor of Paleontology at the Ohio University College of Osteopathic Medicine. "We don't know to what extent its parents were bringing it food, and so it was probably already a pretty capable hunter. Its skull wasn't as strong as the adult's, and would have had to have been a more careful hunter, using quickness and agility rather than raw power." Animation of the skull of a newly discovered juvenile specimen of the Mongolian tyrannosaur Tarbosaurus with the bones and some other anatomical structures labeled. The juvenile was only 2-3 years old when it died, providing insight into the growth and changing lifestyles of tyrannosaurs. Animation by Ridgely and Witmer, Courtesy of WitmerLab at Ohio University. The different hunting strategies of juveniles and adults may have reduced competition among Tarbosaurus and strengthened their role as the dominant predators of their environment. "The juvenile skull shows that there must have a change in dietary niches as the animals got older," Tsuihiji said. "The younger animals would have taken smaller prey that they could subdue without risking damage to their skulls, whereas the older animals and adults had progressively stronger skulls that would have allowed taking larger, more dangerous prey." These are silhouettes of an adult Tarbosaurus and the newly discovered juvenile, along with a human for scale. Credit: Hayashibara Museum of Natural Sciences. The late Cretaceous environment offered plenty of options for prey. "Tarbosaurus is found in the same rocks as giant herbivorous dinosaurs like the long-necked sauropod Opisthocoelicaudia and the duckbill hadrosaur Saurolophus," said Mahito Watabe of the Hayashibara Museum of Natural Sciences in Okayama, who led the expedition to Mongolia in 2006 that uncovered the new skull. "But the young juvenile Tarbosaurus would have hunted smaller prey, perhaps something like the bony-headed dinosaur Prenocephale." The juvenile skull also is important because it helps clarify the identity of small, potentially juvenile specimens of other tyrannosaur species previously found. "The beauty of our new young skull is that we absolutely know for many good reasons that it's Tarbosaurus," Witmer said. "We can use this known growth series to get a better sense of whether some of these more controversial finds grew up to be Tarbosaurus, Tyrannosaurus or some other species."